I’ve done many things involving government, including being a City Councillor, Cabinet minister and several years in charge of BC Constitutional Affairs. 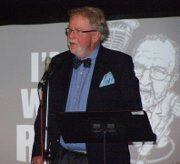 In a 25 year radio career concentrating on current affairs, I was the only major journalist in Canada who opposed the Meech Lake Accord/Charlottetown Accords and I played a major role in spawning the Citizens’ Assembly on Electoral Reform. I have had 13 books published including bestseller Canada, is Anyone Listening. Frankly, our parliaments are not working, only needing the public to understand how the system really works. It’s serious, and I have some thoughts on making substantial yet uncomplicated improvements and they’re in my new book, Politically Incorrect, How Canada Lost Its Way and The Simple Path Home, published by Watershed Sentinel Books due out October, 2017. Parliament is badly broken and ironically by a tool making the Prime Minister and cabinet “responsible” to the House of Commons which has become the tool whereby the PM totally controls the Commons. The government MP plays no part in forming policy or legislation, his rare questions in the House are scripted and must be punctiliously followed, he must always vote as ordered, has his speeches and constituency reports written for him and on it goes. I demonstrate how the PM enforces this discipline with rewards and penalties, including permanent expulsion, all backed up with plenty of evidence. Then, I demonstrate how this can be easily cured at no cost or need for constitutional amendment, only needing the public to understand how the system really works and insist upon changes that return independence to the MP and make him/her answerable to his constituency, not the backroom boys in the PMO. Who could oppose this reform? All who prosper from one man rule by the Prime Minister, the backroom boys, the lobbyists, the elite and especially the oil industry which now controls Canada’s media as seen so clearly in BC, where it sustained the last government for 16 years. Stay tuned, the book is finished and goes to the printer early next month.